Stephanie Thorburn, who has provided us with many more reports in the past, had been invited to the Bunbury's Birthday Party by David English and also promised GSI to write a full report about this special event. Thanks Stephanie, for your wonderful contribution and thanks Keith Curtis for the lovely photos. Bunbury's 21st Birthday Party- 10th May 2007. Special Report: Stephanie Lynne Thorburn. Thursday 10th May had been an unknown quantity in my diary for many weeks prior to the day itself. David English's seemingly boundless contacts book would generally result in only a certain proportion of those called up to serve the greater cause of 'Captain Bunbury' actually able to attend. 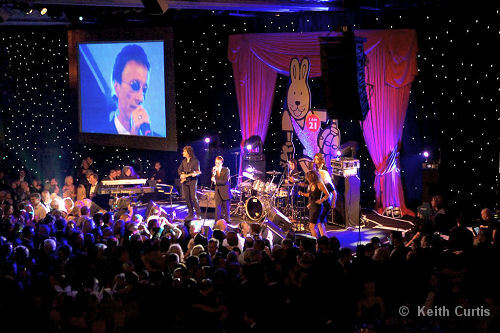 However, on arriving at the Grosvenor Hotel for the Bunbury's 21st the guests gathering in reception included many conspicuously familiar faces from the worlds of popular music, comedy and cricket. This was destined to be an unprecedented evening of entertainment! With my VIP golden ticket I entered the champagne reception area where, without exception, a full turnout of David English's friends and companions were starting to congregate to celebrate the Bunbury's legacy. This beginning proved to be very fruitful for me as I noticed Bill Wyman standing behind David, with his sparring partner from the distinguished Rhythm Kings band, Terry Taylor not far away. I had originally met Bill back in the early 90's at some sublime Bunburys matches, where rain stopped play only to witness Bill and Terry reach for their instruments from under the canopy at grounds like Blenheim Palace and Penshurst Place.. It was good to see Bill supporting the cause once more, still just as candid, speculating as to whether tonight was to be a 'men only' oriented evening! The occasion actually turned out to be quite cosmopolitan as The Great Room welcomed us to congregate for dinner and entertainment. Negotiating past the elaborate chandeliers, I felt as if we were filming for a classic Bond movie, with a vast sea of people now filing down toward the large expanse of the main function room, past a back cloth of opulent grandeur in the half light. The cricketers' 'hall of fame' ensued with Ian Botham, Mike Gatting, David Gower and Devon Malcolm amongst others emerging from the balcony as the guests were seated. Around this time, rumours of Eric Clapton's 'grand entrance' resounded, with David English coming to the rescue as the receptionist had apparently failed to recognise our popular music legend! Eric finally arrived and passed my table stealthily toward the centre of The Great Room, where Robin Gibb, Bill Wyman and David English were all seated in close proximity. The M.C. for the night was Rory Bremner, who was complemented by the intellectual wit of Stephen Fry, both of whom greatly enriched the occasion with their perceptive rhetoric and satire. A central focus for the guests proved to be the Bunbury's charity auction, which included some unique lots. A guitar used by Robin Gibb and signed by both Robin and Barry raised some £10,000, with 'A Studio Day With Robin Gibb' receiving a great deal of attention too. 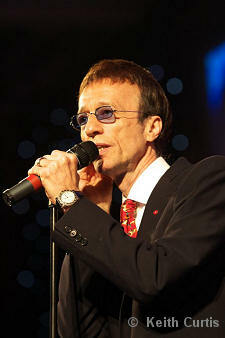 The highest bidder gave £30,000 for the opportunity of a day in the studio with Robin Gibb to experience the art of music writing and producing. Another unique contribution was the auction of a 'slowhand' original guitar, a black Stratocaster used by Eric Clapton that sold for £35,000. There were a variety of speeches and testimonials on the theme of David English's extraordinary Bunburys, including one very special message sent by Barry from Miami, which provided both a warm and emotional contribution. David English's own speech was highly fruitful, containing some considered reflections on his career and the history of RSO from the early 70's. He recounted that the music of the likes of Eric Clapton, The Bee Gees and Stones had in effect offered us a 'soundtrack for our own lives', and he declared it an 'honour' to have been a part of the Gibb family over the years. Particular tribute was paid to the absent Bee Gees, both Andy and Maurice who are no longer with us today. 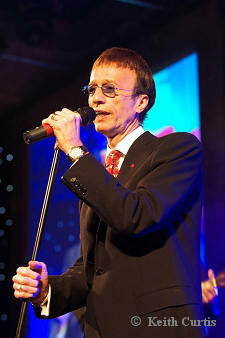 This touching speech formed a fitting pre-cursor to Robin Gibb's concert. 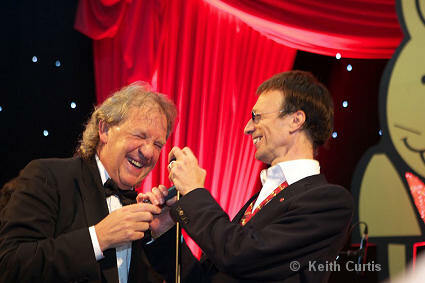 It was by now almost the witching hour as a very special 'Bee Gees' band took to the stage. The lights went up on Robin performing 'To Love Somebody' closely followed by 'Massachusetts', with the crowd surging forward toward the stage. There were apparently 1,200 people present in The Great Room by this time, all of whom were undoubtedly enthused Bee Gees fans. The emotion of the evening was certainly charged and carried through very well by Robin Gibb, who delivered some beautifully pitched highlights for us. Robin exploring many seminal Bee Gees hits with clear pride and his band provided some sophisticated support, comprising both male and female backing vocalists who covered vocal parts in the absence of Robin's siblings. 'Words' was overtaken by the up-tempo 'Jive Talkin', and then we were eclipsed further toward the disco era, as defined by 'More Than A Woman', 'How Deep Is Your Love', 'Night Fever' and 'You Should Be Dancing'. Robin actually used little falsetto, rather executing his deft vibrato tone with some considerable vocal strength and beauty. The contestants on 'American Idol' would have almost certainly learned a thing or two about the origins and depth of the Bee Gees material from Robin's display of dexterity at The Bunbury's 21st concert.. Emotionally charged versions of 'You Win Again', 'Tragedy' and 'Stayin Alive' brought us to the end of Robin's set, with the material bearing a strong similarity to his live 2005 orchestrated recording- although I think the vocals and acoustics at this concert were actually stronger than on CD. When the evening was finally brought to a point of closure, Robin was asked to perform a solo recital of 'Massachusetts' for a £5,000 charity contribution. He responded to this offer with a vengeance, with his distinctive voice supported by an acoustic guitar alone. For a few minutes, it was actually possible to envisage The Great Room as representing a church or place of worship, such was the ethereal resonance of Robin's vocal tone. As I was setting back home a little before 2am in the morning, I was fortunate enough to catch up once more with Bill Wyman and Terry Taylor who had both clearly enjoyed the night enormously. David English was still busy dancing and swaying to Bee Gees hits on the disco floor. In fact, the venue momentarily resembled a 70's disco club night, yet this incongruous notion was unlikely with the grandeur of the surroundings and sentiments captured during this wonderful evening being entirely unique and inimitable in essence. This had truly been a surreal occasion spent and shared in the company of a host of true stars.. Several times during the evening, David reminded us that we would never be here again, for such a momentous Bunbury's occasion. But the night will live in our memories forever. Fireball Management and all who contributed so generously to this marvellous occasion! 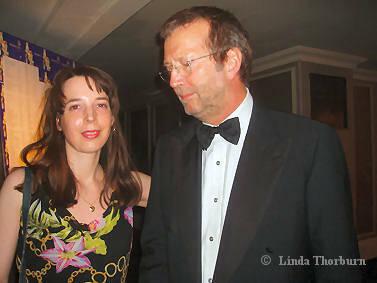 This photograph is of me (Stephanie T.) with Eric Clapton, and was taken during Robin Gibb's concert. 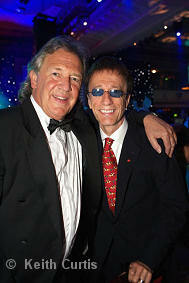 Eric Clapton is of course very central to the Bunbury's project, having been a co-founder with David English.